We know parents are willing to do what is financially necessary to support their student’s future. Besides using savings, or applying for financial aid and scholarships, student loans offer a way for parents to fill the gaps to help support their student’s higher education costs. Student loans are a great tool to use to go to college with nearly seven in 10 college seniors (68 percent) borrowing them in 2015. What makes loans manageable for families are how they can fit into any budget. Federal loans offer many repayment options including income-driven plans that allow you or your student to make payments based on discretionary income. Private loans also offer more flexible options to finance your student’s education and still be repaid in a reasonable manner. Along with repayment options, there are postponements (deferments and forbearances) available for limited amounts of time. These postponements allow you or your student to put payments on hold during times of financial hardship. Though it should only used when absolutely necessary, student loans do offer another level of flexibility during repayment to help avoid missing a required payment during times of difficulty. Another benefit to student loans (especially in the student’s name) is to help your college student build credit. College students who are 18 to 24 years old tend to have difficulty getting credit approved due to their lack of a credit history. When they are approved, their interest rates are typically much higher than someone a few years older because of their short credit history. Having student debt in their names helps them to build good credit early on and can get them on the pathway to good repayment habits before they are out of college. As a parent, you can help teach your student about good money management by encouraging your child to make payments while still in school. These can be interest-only payments or small, affordable payments each month. If you’re on the fence about allowing your student to borrow student loans instead of yourself, you can always take out private loans jointly. As their co-signer, you’re the backup plan if they can’t make payments for any reason. Possibly the most important reason to encourage smart student loan borrowing while in college is to give your child a sense of responsibility for their education. The average cost of a public four-year in-state college for the 2017-2018 academic year was $20,770 and $46,950 for a private, nonprofit four-year college. With costs this high, it can be easy for your child to lose a sense of how much this money really is. Having your college student borrow for school helps reinforce that they have skin in the game. College completion and finding a job matter because your child will need to repay those loans whether the college program is completed or not. 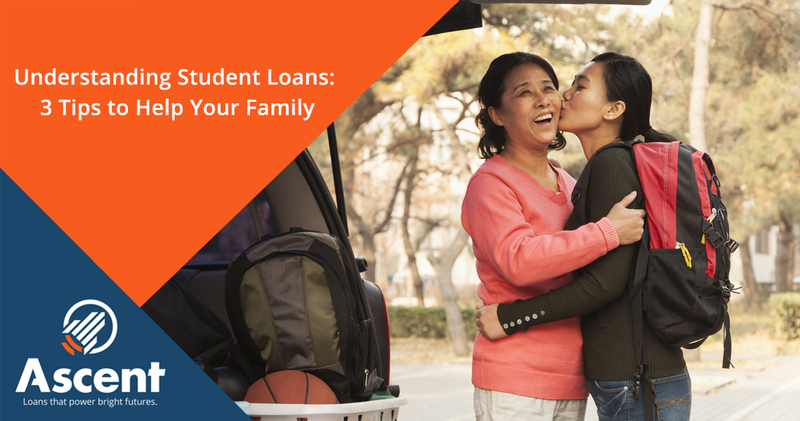 By utilizing student loans your child will be set to succeed in their quest for higher education, better job placement, and being prepared for loan repayment – and you’ll be there to lend a helping hand if needed. Next To Transfer or Not to Transfer?